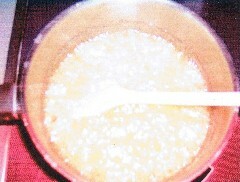 Pour this mixture in a caramelized mold (soufflé dish) and cover with foil paper. 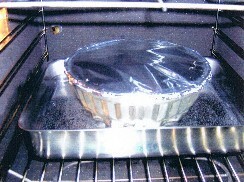 Place the mold into a bigger one with boiling water in preheated oven to 180° C for 30 min. 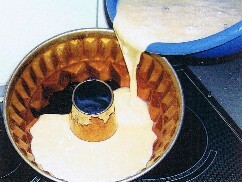 Then uncover flan and lower temperature to 150° for about 40-50 min. 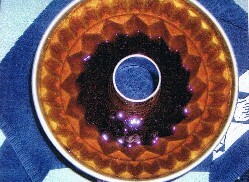 or until you insert a knife in center and it comes out clean. 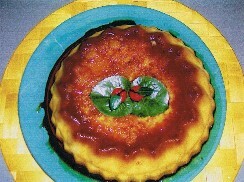 Let it cool completely, refrigerate and then unmold it the following day. 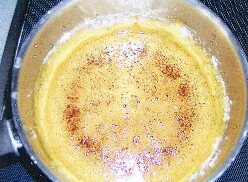 ► Tip: You can add a little alcohol to mixture. 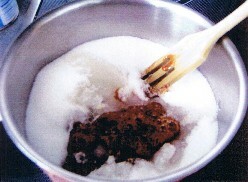 - Put 2 cups of sugar, 1 cup of water and 1 cup of dry coconut into a small deep saucepan and stir continuously until it thickens.